In my interaction with Peter Leithart's The End of Protestantism, I have noted times of confusion over Leithart's presentation style. There are many interesting chapters that seem long discourses destined to fizzle in importance. Sometimes it is only much later that a section's relevance becomes clear. There was one such section that seemed rather pertinent and I'd like to spend some time on it. A secular view would probably mark this as racism itself. Leithart had just finished up a section relating the profound segregation of churches after the conclusion of the Civil War and all roads point to latent racism. But Leithart states that "these simplistic explanations do not reveal latent racism" [emphasis mine]. Yet, Leithart thinks there are many problems with these "simplistic explanation." With Emerson and Smith, Leithart attributes these answers/explanations to the "the racial isolation of white evangelicals and the limitations of their cultural 'tool kit,'"
Put simply, evangelicalism's emphasis on personal accountability and responsibility is incapable of perceiving the innate structural issues at the base of America's racial issues. The church's decentralization of responsibility (found in varying degrees across different denominations), renders no one someone else's keeper. This is particularly true concerning matters of race which are only exacerbated by our proficiently segregated churches. Instead of speaking of corporate sin, the theology of the evangelical church demands that personal sin be the answer to race problems. It cannot be a structural problem, thus any structure that claims such becomes "the other group" with their own problem. This only furthers the homogeneity of race across denominations. Even marked "victories" within American Evangelicalism are marked by how many minorities they have in the church (individualistically centered) — a shoddy substitute for reconciliation of entire churches or groups. And this is where the rubber meets the road for Leithart. 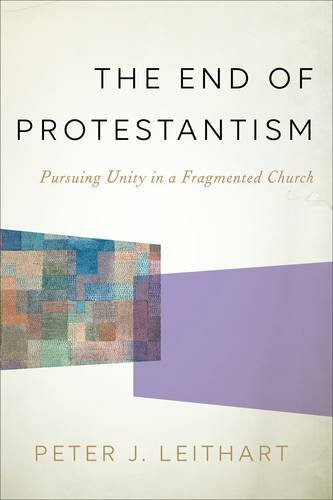 Conquering racism is good but uniting the churches divided by racism is Leithart's goal for the church (and the purpose of The End of Protestantism). Leithart, with the help of Emerson and Smith, concludes that "Evangelicals want people to get along" but "the evangelical outlook is 'a powerful means to reproduce contemporary racialism.'" Leithart cannot be accused of being a leftist or liberal. But his criticism of the conservative church's plugged ears surely will not win him fanfare from his target. For Leithart's vision of a unified church, latent racism and individualism — to a certain extent congregationalism — are unacceptable within the church. But he also argues that to remove one we must work to remove them all. And that he refers to as the goal/purpose/end of Protestantism.